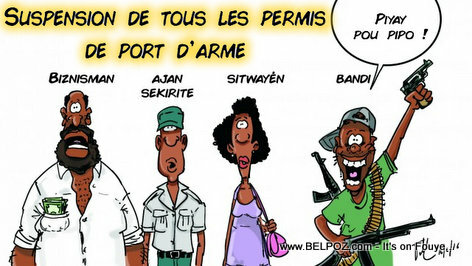 ENGLISH: All gun permits have been suspended in Haiti, you are NOT allowed to carry a weapon even if you have a permit for it until further notice... Only the Police and UN Peacekeepers are allowed to carry guns in Haiti for now by order of the Haitian government... What do you think about that? Decision saa en vigeur depi Jeudi 09 Juin 2016 la... Ou te konnen sa? « My Scariest Dream about Haiti - VOLCANOES Errupt Everywhere! Zam bandi yo pat janm otorize non, yo te konn kite yo lakay? Se pou moun ki pral leve kont privè yo poul ka gen kontròl yo wi, men elas, bandi yo pat janm gen pèmi, yo pa janm bezwen pèmi tou. Minis jists la pale sou radio Caraibes maten an poul fe konnen ke leta pran jan de mezi sa yo a koz de infomation ke yo genyen ke yo poko ka revele.